Great news - the Brazil vs Maori game will be streamed live on Twitter in English and Portuguese. It will also be made available on SporTV in South America but the fact that anyone can just go on Twitter and watch it for free is great news for using this to grow the sport in Brazil. I wish our games were broadcast on Twitter here. About 15,000 tickets sold for the NZ Maori match with a week to go. I thought that just wanted to check! Nearly 25,000 is still a big achievement. Great news. As the Estádio do Morumbi has 66k seat according to wikipedia, are more sections on sale? Are Brasilians more likely to turnup short notice so maybe 30k could be achieved? Under 12s don't pay, this means yes, more people can come. There are some NGOs planning to take kids to the stadium. Three 2014 WC stadiums with rugby use. Furthermore, Arena da Amazonia in Manaus will host a match between local club GRUA and a São Paulo's lower division select (TBA soon, but it will happen). Victor, do you know about this? Yes, I'll publish tomorrow. It is Rugby League. Guys that play Rugby Union wanting to have some fun with League in the post-season. 3 players from OneRio's Project Blue going to the UK for 3 weeks. There will be a documentary made, here is a trailer. OneRio's Project Blue is an impact driven programme that works to supress the core drivers of gang involvement and school abandonment. It does this by offering a unique sporting, educational and cultural experience to participants over 18 years, to take part in The Varsity Match and visit our partners at the OURFC Blues and Cambridge University Rugby Union Football Club. To qualify, participants needed to obtain +80% attendance in rugby programmes, english classes and an educational course that is aligned with the young persons academic/professional objectives that year. From the 5 candidates this year who took part in the selection process, 2 completed secondary education, 1 took this years nationwide university entrance exam, and one has excelled through 2 years of primary education after returning to school through the programme. All 5 are currently obtaining voluntary work experience through the employability programme. 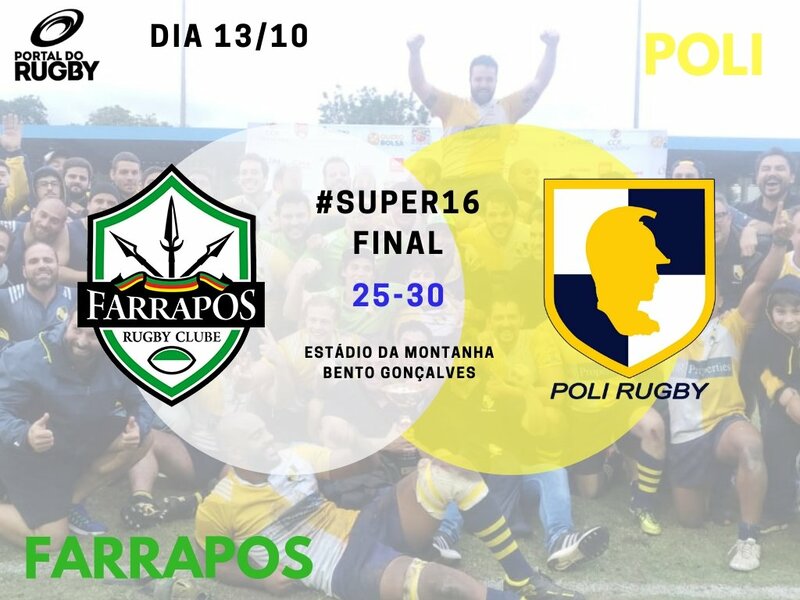 OneRio was created by Niterói RFC'S player Robert Malengreau, cousin of Juliano Fiori, ex Tupis. Malengreau played the "B" teams version of the Varsity Match for Oxford, while Fiori played the main match for Cambridge. Fiori was the 2nd Brazilian playing it. The first one was a São Paulo state-born guy named Collin Allan in 1961 for Cambridge that I find out in an old newspaper. We couldn't care less about men's club sevens. The 2018 tournament was postponed to January/February 2019. Qualy Tournament on 19-20 Jan in SP and Final Tournament on 16-17 February in Rio. It happens here too, played over a single weekend and with small entry lists. Maybe a regionalisation of the competition wouldn't be a bad idea, with CBRu member states fielding regional sides. Every year all the states should have their own sevens competition but in 2018 we hit the bottom. São Paulo had no competition and other states had tiny tournaments. Santa Catarina should be indicated to the Guinness Book of records. Their oficial sevens state championship had 2 clubs. That's it. As predicted, the Sports Ministry is now extinct. It was merged with others. It will probably mean less money for all Olympic sports. Half of all budget to pay athletes (Bolsa Atleta) has just been cut. That is a R$ 1,5 million surplus through September compared to a R$ 3 million deficit in 2017. A million dollar swing in just nine months. And it should look even better after the Maori game earnings are counted. Mangin is a great guy and he does what he can. But junior rugby in Brazil is non existent and we are NOT growing. All numbers about junior rugby are mambo jambo if we think about more players entering contact rugby. The only thing is happening is that our U20s squad indeed has a good high perfomance structure behind. But that is it. A U20s high performance of players that don't have club rugby to play and basically train.